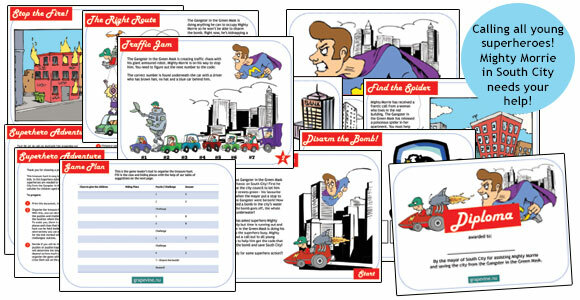 This Superhero Adventure is the perfect activity for any young superhero. Help! The Gangster in the Green Mask has planted a bomb in South City! Mighty Morrie needs you to defeat the villain and get the code to disarm the bomb. An entertaining treasure hunt with exciting puzzles to solve and challenges to complete - all in a really imaginative setting! You get everything you need to organise a fantastic superhero party in under half an hour! Our treasure hunts are original products created especially for kids to get involved in an interactive adventure. With an exciting story and mysterious puzzles the kids are whisked into a world of superheroes! With the help of our easy-to-follow structure, clever game plan, adaptations for different age groups and interesting puzzles and challenges, it's easy to organise a truly amazing party. The game can be played at any home, inside or outside. You can also adjust the duration of the game by including or excluding challenges and it works for any number of children. If you're a large group, you can divide into teams. The approximate length of the game is 40-60 minutes depending on how many you are and where the game takes you. The treasure hunt follows a game plan whereby the kids receive clues to find puzzles and challenges that must be completed. In this case, to get the code that will disarm the bomb that the Gangster in the Green Mask has planted in South City. To keep Mighty Morrie and his team of young superheroes from figuring out the code, the Gangster wreaks havoc all over the city. It's a race against time and a real superhero adventure! Even an invitation to a Superhero Party is included! Purchase and download the product in minutes. Prepare the party and send the kids to South City to help Mighty Morrie crack the code!